My mum came round for dinner last week. Those of you who learned their love of food at mother’s apron strings will be familiar with the leap of excitement and dread those words can summon. Because if there’s someone you want to impress, it’s your mum. And so there was much scratching of head and leafing through books. Italian was out, my mum loves Italian, and she’s much better at it than me. Time to look to my own strengths and influences. In this case the Eastern Med. Whenever anyone comes round for dinner I try to do as much as I can beforehand. But inevitably it ends up with us all in the kitchen slurping wine and chatting away while I, with increasingly frantic movements, try to hold up my side of the conversation and ensure the food’s ready on time. Happily, this is a simple dish. I served it with some couscous and a green bean & hazelnut salad. Both came from the Ottolenghi book. This I didn’t bother to adapt much at all. I merely changed a few spices to match what I had in the cupboard. This is easy peasy, and it looks great. The main thing is to marinade it for plenty of time. You want to make sure those flavours get jiggy with one another and spawn something beautiful. And the quality of the chicken. This is really important, it must be a really good chicken. One that’s been allowed to roam free (or least take the odd stroll) and grow into maturity slowly and gracefully. Whatever you do, you don’t want to get a Schwarznegger of a fowl, pumped full of steroids, anti-biotics and growth hormones. Fattened to the point where it can’t walk. It’ll look plump and shiny and white and will taste of sweet FA. And be overwhelmed by the other flavours unbalancing the dish. Whereas if you get that slightly gamey, stringy and leaner looking bird, more Daniel Day Lewis than Arnie, it’ll have far more character and depth. Chicken is one of those meats where you can really tell the difference between battery farmed and free-range. It got my mum’s seal of approval, so it must be good. This is a dead easy dish to make. The only difficulty is finding the za’atar and sumac, particularly if you’re not in a big city. The best places to look outside middle eastern grocers are anywhere that has Barts spices. my local Waitrose stocks their spice mixes including za’atar, and some Sainsbury’s do it too. If you can’t find sumac, just squeeze over a little more lemon juice. It’s not the same, but it helps give it that citrussy kick. Instead of za’atar, mix up some equal amounts dried herbs (thyme and oregano are best) and roasted sesame seeds, it comes pretty close. Put the chicken in a bowl, add the onions, galic, olive oil, paprika, cinnamon, sumac and lemon and mix well with your hands. Pour over the water, season with some black pepper, and mix again. Make sure every piece is well coated with the marinade. Cover with clingfilm and leave in the fridge overnight (I left it for about 24 hours). Heat the oven to 200oC. Toast the pinenuts in the oven until they start to to turn brown – about 3-5 mins. Put the chicken pieces in a roasting tray big enough to hold it all in a single layer and pour over the marinade. Sprinkle over a little sea salt and grind over some black pepper. Sprinkle over the za’atar and pinenuts, and a little more sumac if you like. And put it in the oven. Cook for about 40 minutes until the juices run clear when you slide a knife into the thigh. Take out and leave to rest for ten minutes or so. Sprinkle over the parsley and serve. I love a bit of zingy chicken – sumac is reet nice. Never tried za’atar though. Will have to track some down. Schwarznegger of a fowl – chuckle chuckle! Well done for impressing the mum! I had my MIL to feed last weekend. Gulp! I am happy to be able to report that all went well, though. You big show off! When my parents in town, I have to take them out otherwise my Dad takes over in the kitchen. Not that I’m complaining! Can’t say I’ve dabbled too much in the flavours of the Levant but with the onset of summer (you’ve got to be optimistic), I may give it a whirl. After all, what can go wrong with roast chicken………. Oh we’re all trying to impress our mum’s with our cooking, one of our hardest judges to face. Glad it went so well! I bought sumac a few weeks ago, will try it on chicken as well! @meemalee – Do get hold of the stuff, it;s a great addition. At first i didn’t think it would add much. But then i tried it. Yum. @Maninas – thanks – it just popped out of my brain on the keyboard… I always try to impress my mum with food, it’s the least I can do for the years of wonderful food she’s given me. Something new usually does the trick. Introduced her to Lebanese, Thai, Viet, Turkish & Moroccan food thus far. @Su-Lin – thanks! She really liked it, which made me grin like the Cheshire Cat And yes, do get the book, it’s fab. @Mr Noodles that’s me We do meet out quite a lot too – it’s just nice to have a relaxing evening at home too sometimes. Handing over the kitchen to any parent is a difficult thing for me Heh. You should definitely go for this, lemon, sumac and garlic – all so summery. Add some wine and it would make a great BBQ marinade. @Greekfoodlover – i think we are . Hard because they’re honest. And when i get the thumbs up I know I’ve done good. Sumac was ace on chicken, I also love it sprinkled on a whole host of meze. God, this looks gorgeous. I’ve got to try this recipe. I’ve been going a bit ottolenghi mad lately, but all their stuff is just so good! @Heavenly Housewife – thanks! It did taste pretty damn fine. Their stuff is really good. That book is a GoTo book for ideas and dishes for me. Great combination – I adore za’atar and sumac. I havce big jars of both in my kitchen. I must try this – thanks! I admit having missed this recipe altogether from Ottolenghi’s book, and I thought I had tried the most interesting ones. 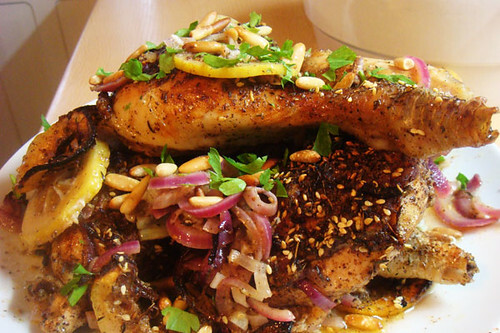 Hmmm, love za’atar, sumac cinnamon and pine nuts, and combining these with roast chicken is a great idea. I always make the green beans, mange tout and chives salad with hazelnuts, it is dead easy but so good. @Niamh – thanks – it’s all down to Yottam (and Sami?). I urge you to try it, it’s one of the best chicken dishes i’ve tried. @The London Foodie – it’s very unobtrusive and short, easy to overlook. But so easy to make. Lovely. Wonderful recipe. Za’atar and sumac make everything better. Will try it this summer for my mother! They are one of those foodie panaceas. Hope it goes as well for your mum as it did for mine! That looks totally stunning. Added to the must-try list. @Lizzie – thanks! It was pretty tasty. And good looking too.